Eye On Sports Media: A Baker's Dozen: The Super Bowl XLII Accredited Photographers "Guidelines"
A Baker's Dozen: The Super Bowl XLII Accredited Photographers "Guidelines"
Athens, GA (Feb 3, 2008) - The NFL has published the following "guidelines" for photographers accredited to cover Super Bowl XLII at University of Phoenix Stadium. Note that these are by no means guidelines, but the rules that must be followed by photographers working tonight's game. The most controversial might be the color-coded vest if they are still adorned with "CANON" logos, as this caused a huge stink in the journalist community when first issued. 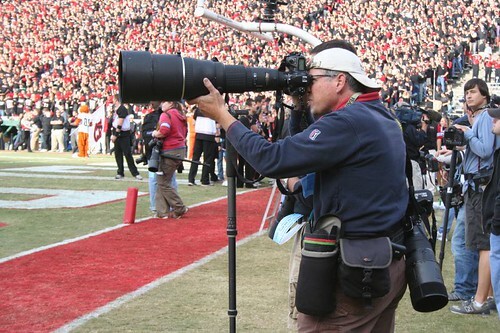 This photographer, working the Auburn-UGA game in November 2007 would be in violation of NFL Guidelines because he is not "kneeling". 1. Photographers with field photo credentials should report to the photographer registration area, which opens at 12:00 PM. This is located adjacent to the RF check-in near check-point M, outside Gate 1. 2. Each photographer is issued a color-coded vest which must be worn on the field during the Super Bowl. 3. All photographers are reminded that the three-foot shooting zone on both sidelines is reserved only for the broadcasting network (FOX) and NFL Films. The network television crews have priority in certain areas. Those areas are defined as the 29-yard line on both sidelines and in front of the end-zone camera position. 4· All photographers and grips must kneel on one knee while shooting the game. 5 Messengers must be at least 18 years old and are required to remain against the walls of the stadium along the sidelines. Children and other non-working personnel are not permitted on the sidelines at any time. 6. At halftime, refreshments will be available for photographers and messengers in a tent outside the stadium. Restrooms are also located in the southwest field tunnel area. 7. No tripods are permitted on the field. 8. Monopods should be used for 300-millimeter lenses and larger. 9. Live television interviews are not allowed inside University of Phoenix Stadium until the conclusion of the FOX postgame show. 10. No equipment should be placed on the ground during the game. All equipment must be attached to the photographer or with the photographer’s grip. This is essential and will be policed diligently. 11. Areas near the entrance to the field will be kept clear during player introductions and when players are coming on and off the field. 12. Flip cards will be distributed at approximately 1:00 p.m.
13. The Super Bowl trophy presentation will be held on the field at the 50-yard line following the game. Similar to other NFL games, media with field photo credentials will be permitted on the playing field at the conclusion of the game. Media should be aware that equipment and staging for the postgame trophy presentation will be entering the field at the same time. Please cooperate fully with stadium security and remain clear of all personnel moving and constructing the stage.